Bisoprolol 2.5 mg: Coated tablets: Box of 28. Bisoprolol 5 mg: Coated tablets: Box of 30. Bisoprolol 10 mg: Coated tablets: Box of 30. Bisoprolol 2.5 mg: Each tablet contains: Bisoprolol hemifumarate: 2.5 mg.
Bisoprolol 5 mg: Each tablet contains: Bisoprolol hemifumarate: 5 mg.
Bisoprolol 10 mg: Each tablet contains: Bisoprolol hemifumarate: 10 mg.
Excipients: microcrystalline cellulose, corn starch, colloidal silica, hypromellose, dibasic sodium phosphate, magnesium stearate, croscarmellose sodium, titanium dioxide, macrogol 6000, iron oxide. Bisoprolol is a medicine belonging to the beta-blocker family. 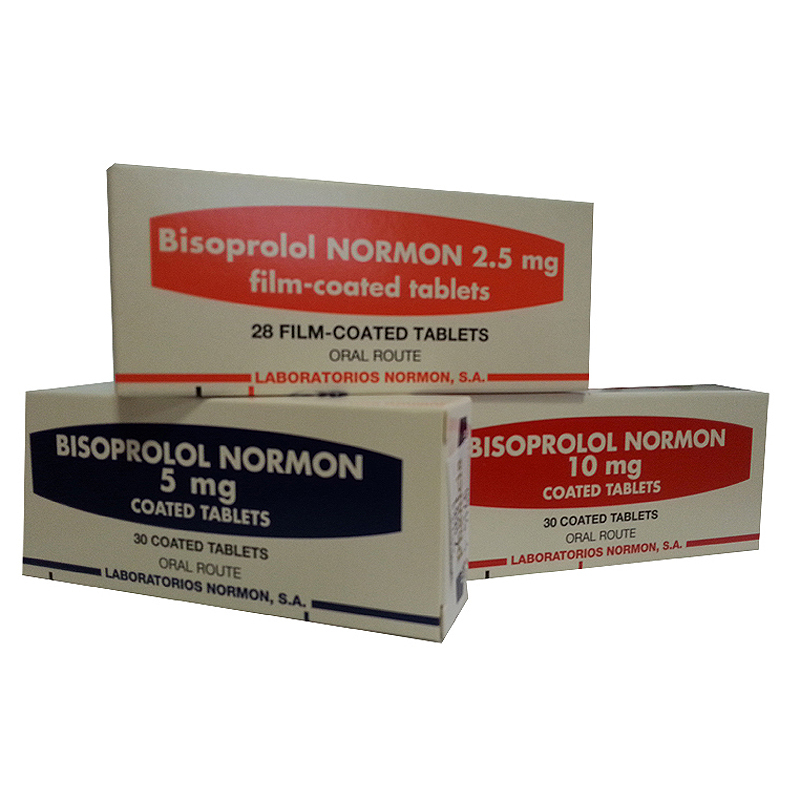 Bisoprolol Normon is indicated for the treatment of arterial hypertension and stable chronic pectoris angina. Allergy to bisoprolol or any of the excipients. Acute heart failure or heart failure decompensation requiring treatment, cardiogenic shock, 2nd or 3rd degree AV block without a pace-maker, chest disease, bradycardia or hypotension. Severe asthma or severe chronic obstructive pulmonary disease (COPD). Severe circulation disorders in the legs (such as occlusive diseases of the blood vessels and Raynaud’s syndrome). Untreated phaeochromocytoma (whose symptoms are hypertension, tachycardia and headache). Metabolic acidosis. Treatment should not be stopped suddenly. The dose should be gradually reduced. Athletes should bear in mind that bisoprolol may produce a positive result in drug tests. Children: the safety and efficacy of bisoprolol has not been established in children; therefore its use is not recommended in the population group. Taking bisoprolol simultaneously with floctafenine is contra-indicated. Verapamil and diltiazem: may cause a severe drop in blood pressure and atrioventricular block. Clonidine: may cause hypertension and excessive reduction in heart rate and conduction. MAOI, except B: strengthens the hypotension effect of bisoprolol and increases the risk of hypertensive crisis. Dihydropyridine-type calcium antagonists (e.g. nifedipine): increases the risk of hypotension and may cause cardiac arrest in patients with heart failure. Class I antiarrhythmics (e.g. dispyramide, quinidine), class III antiarrhythmics (e.g. amiodarone), parasympathicomimetics (including tacrine), digitalis and other beta-blocking drugs (including eye-drops): may strengthen the effects on the heart. Insulin and oral antidiabetics: may intensify the effect of hypoglycaemia and mask its symptoms. Anaesthetics: increases the risk of hypotension, because of which the anaesthetist should be informed. NSAIDs and corticoids: reduces the hypotensive effect. Ergotamine derivatives: increases peripheral circulation disorders. Sympathicomimetics: may reduce the effect of both medicines. Tricyclic antidepressants, barbiturates, phenothiazines and other anti-hypertensive medicines: increases the hypotensive effect. Rifampicin: may reduce the effect of bisoprolol. Mefloquine: may increase the risk of bradycardia. This medicine may affect the capacity to drive vehicles or operate machinery. This should be born in mind particularly when starting treatment, when changing medication or when associated with alcoholic drinks. Lactation: Breastfeeding is not recommended during treatment with bisoprolol, as it is not known whether this medicine is excreted in breast milk. Frequent (≥ 1% and < 10%). Circulatory: cold sensation or swelling in extremities. CNS: tiredness, exhaustion, dizziness, headache (especially at the start of treatment). Digestive: nausea, vomiting, diarrhoea and constipation. Infrequent (≥ 0.1% and < 1%). General: muscle weakness and cramp. Circulatory: slowing down of heart rate, heart conduction disorders, worsening of heart failure, hypotension on rising. CNS: sleep alterations, depression. Respiratory: bronchial spasm in patients with asthma or history of obstructive pulmonary disease. Rare: (≥ 0.01% and < 0.1%). CNS: nightmares, hallucinations. Skin: allergic reactions (itching, reddening, rash). Liver: increase in liver enzymes, hepatitis. Metabolism: increase in triglyce-rides. Urogenital: sexual potency disorders. ENT: loss of hearing, allergic rhinitis. Eyes: reduced lacrimation (to be born in mind in contact lenses users). Very rare: (< 0.01%). Eyes: conjunctivitis, visual alterations. Circulatory: chest pain. Skin: worsening of psoriasis or rashes similar to psoriasis, alopecia. Treatment with Bisoprolol Normon is generally long-term. It is recommended to take the tablets in the morning before food or with breakfast. The tablets should be swallowed whole with a little water and without chewing. The initial dose is 5 mg/day. If necessary, it may increase the dose to 10 mg a day, up to maximum of 20 mg a day. Treatment should never be stopped suddenly. The dose should be gradually reduced over 1-2 weeks. Kidney or liver impairment: in case of mild or moderate kidney or liver impairment it is not normally necessary to adjust the dose, which should not be more than a daily maximum of 10 mg. in dialysis patients; it does not appear to be necessary to adjust the dose. Elderly: it is generally not necessary to adjust the dose. Children: the safety and efficacy of bisoprolol has not been established in children; therefore its use is not recommended in this population group. In case of overdose, the most frequent symptoms are: slowing heart rate, drop in blood pressure, bronchial spasm with difficulty in breathing and dizziness. Do not keep at temperature above 30°C and keep in the original packaging.